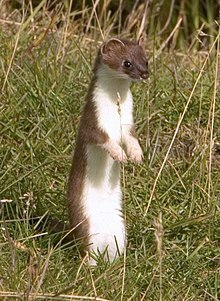 The stoat-wheasel or Scots ermine (Mustela erminea) is a wee mammal o the faimily Mustelidae. Aften uised as a moose-catcher. Wikimedia Commons haes media relatit tae Mustela erminea. This page wis last eeditit on 3 Februar 2017, at 00:24.